The various hybrid offspring of the mega hotel groups continue to spring up in unexpected places. The freshly minted Roomers is the latest property from the Marriott’s diffusion line, the Autograph Collection Hotels. 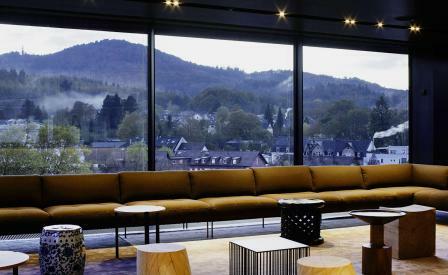 Styled as Baden-Baden’s ‘first luxury lifestyle hotel’, it benefits especially from a terrific, hilly address with views of the adjoining Black Forest. The first of two Roomers to open in as many months – the second debuts in Munich in December – the 130-room hotel is the work of architecture firm KPHwho has carved out a distinctive profile right in the midst of the old spa town. Italian designer Piero Lissoni took command of cladding the façade with contrasting blocks, while organizing the garden’s landscaping. The interiors bear all the hallmarks of the Italian legend’s toolbox – to whit, geometric lines in the pale coloured sandstone tiles and timber screens, low-slung furniture that fairly floats off the ground, Quaker benches, smoked mirrors and low hanging lamps, and a palette of cool greys, light turquoise and soft pastels. The rooftop bar is an oasis of giant potted plants, Chinese tube stools, and angular chairs that provide a perfect perch for scenic snaps of Baden Baden and the greenery beyond. That said, it’s just as easy to be tempted by the pan-Asian menu of ebi udon and deep fried soft-shell crab served with spicy mayonnaise at the in-house restaurant Moriki, or the full body peel with Lomi Lomi oils in the sun-soaked spa upstairs.